Since the sun has finally decided to stay out long enough for the chance of al fresco dining, I've got the perfect recipe to liven up otherwise predictable picnic / barbecue fare. I first tested and shot these recipes in Autumn, hence the roasted grapes, brussels sprouts and chanterelle mushrooms. However, I figured they're still relevant because they're so incredibly customisable. If you've read the introduction of my book you'll know I am all about encouraging people to have a flexible and adaptable approach to cooking. Many people are terrified by this idea, however, I find being open to free-styling in the kitchen is more enjoyable and results in more creative and more personalised dishes. Or sweet options, with smashed berries, jams / marmalades (ideally homemade / handmade and made with natural ingredients without added sugar or additives) nectarines, figs, apricots and other seasonal fruits. + Or for summery alternatives for the below options, simply replace grapes with cherries, brussels with cabbage and chanterelle mushrooms with mushrooms currently in season. 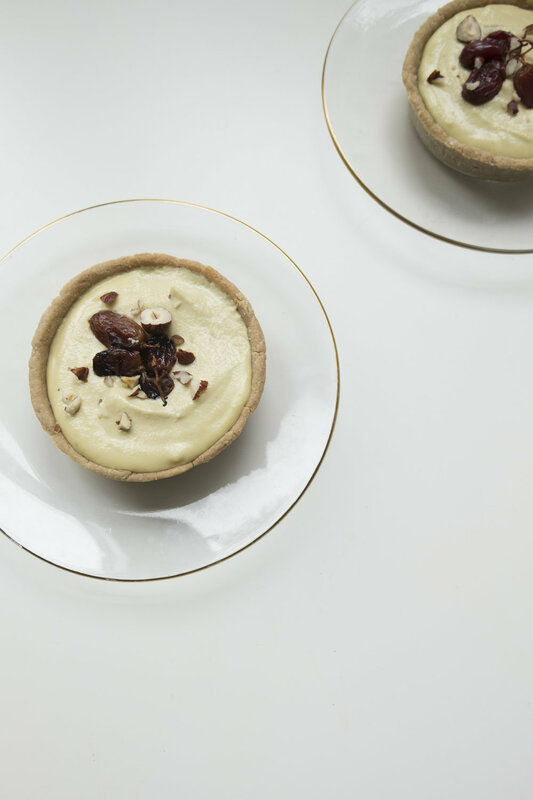 Depending on your fillings, I think the easiest way to make these is to start by making the pastry shells and the cream cheese fillings first, setting them aside whilst you prepare your chosen fillings. If roasting your fillings, it may save time to roast the fillings first, whilst you prepare the pastry dough and the cream cheese mixture. If you are not roasting your fillings, I would begin by making the pastry shells first, and preparing your cream cheese mixture and toppings of choice whilst the pastry shells bake. In a medium mixing bowl, use a spatula to combine all of the dry ingredients. Next, add the oil and mash and stir using a fork to form a crumbly texture. Next, gradually add the water. Add 4 tablespoons first and then 1-2 more tablespoons if the mixture seems too dry or crumbly and isn't forming into a dough easily. Once doughy, form into a compact ball and then break into sections, depending on how many tart trays you are using and depending on the size of them. Grease the trays lightly with a little coconut oil and then press the mixture down firmly into each tin, spreading evenly along the base and pressing up the sides too. The mixture should be around 5mm thick. Place the pastry shells into the preheated oven and bake for 10-12 mins, until beginning to brown. Leave to cool before filling. 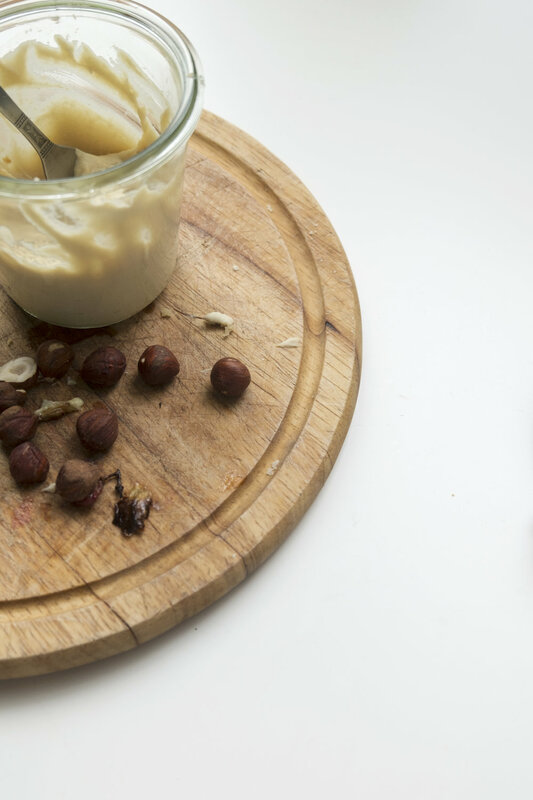 Combine all the cashew cheese ingredients in a high speed blender and blend for 2-3 minutes until smooth. Pour into a bowl or container and set aside or chill in the fridge whilst you prepare the fillings. Simply add all the ingredients to your blender and blend until smooth. Transfer to a bowl or container and set aside or chill in the fridge until needed. Slice the brussels into quarters, lengthways - so you have a few discs rather than wedges. Pierce the grapes as best you can with the tip of a sharp knife and then place in a baking tray, keeping the grapes and brussels at separate ends if possible. Drizzle with olive oil and salt and then bake for 45 minutes, until they begin to shrink and soften. Remove from the oven and allow to cool before assembling into the base of your pastry shells and before topping with your cashew or white bean cream cheese mixture. 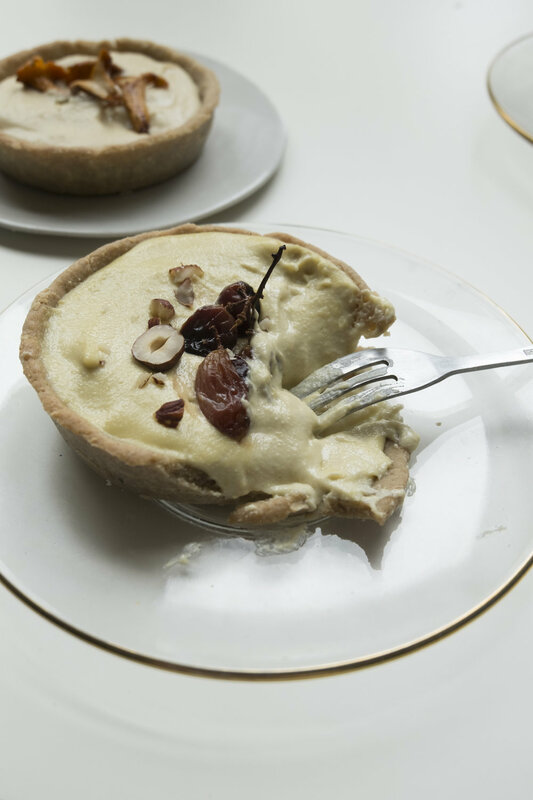 When ready to assemble, simply place a few teaspoons of the roasted grapes and brussels into the base of your pastry shell, then top with your cashew or white bean cream cheese mixture. Smooth the mixture and then top with extra roasted grapes and / or brussels. Serve immediately or allow to cool and store in an airtight container in the fridge until ready to enjoy. Add the oil to a saucepan and once heated, add the garlic. When the garlic begins to brown, add the mushrooms and miso and stir to combine. Sauté over a medium heat for about 10-15 minutes, until the mushrooms begin to soften and the mixture begins to caramelise. 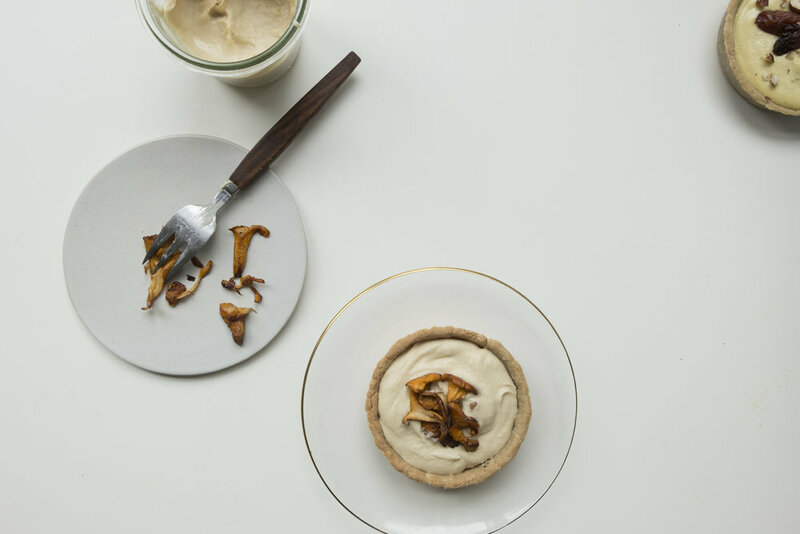 Allow to cool slightly before assembling into your pastry shells and before topping with your cashew or white bean cream cheese mixture. 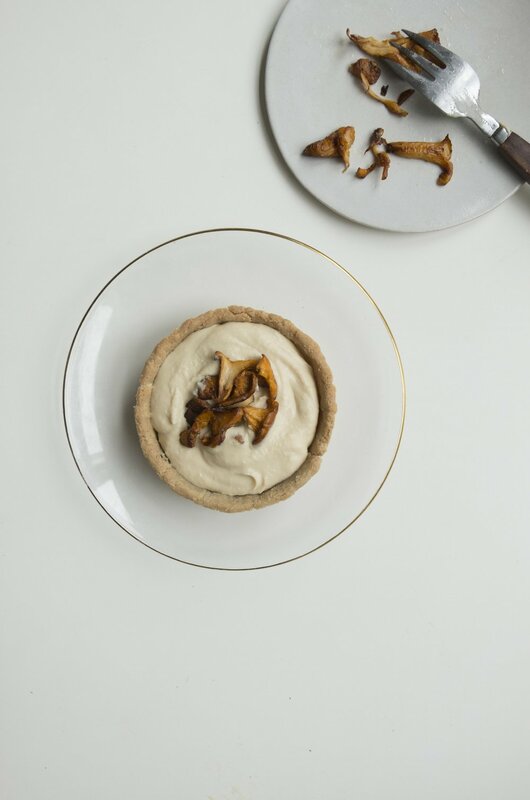 When ready to assemble, simply place a few teaspoons of the mushroom and garlic mixture into the base of your pastry shell, then top with your cashew or white bean cream cheese mixture. Smooth the mixture and then top with extra sauteed mushrooms and garlic mixture and / or nuts, seeds or herbs of choice.